Details about the upcoming Kami Nomi zo Shiru Sekai (the World God Only Knows) 3rd season have been released. The story will cover the Goddesses arc of the original manga by Tamiki Wakaki. 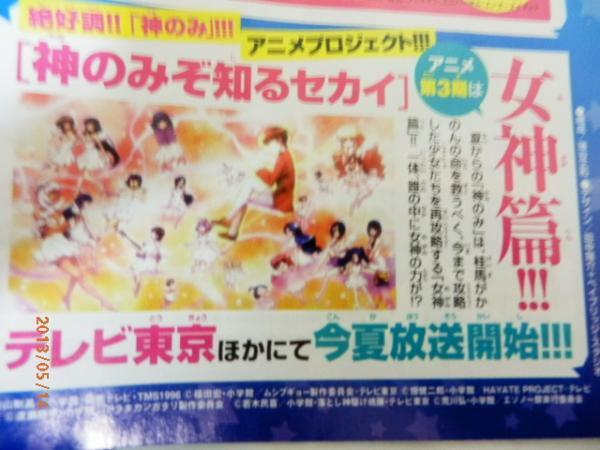 The latest issue of the Weekly Shounen Sunday magazine by Shogakukan has officially announced that the third season of Kami Nomi zo Shiru Sekai will come out this summer and it will cover the stories within the Goddesses’ chapters. Seems like a lot of the mysteries around the Goddess entity will be revealed even for those of you who don’t read the manga by Wakaki-sensei.